Every year, millions of people drive up and over a section of freeway called the grapevine along California's coastal artery, interstate 5, without any idea what lies to the west in those rather inconspicuous hills. 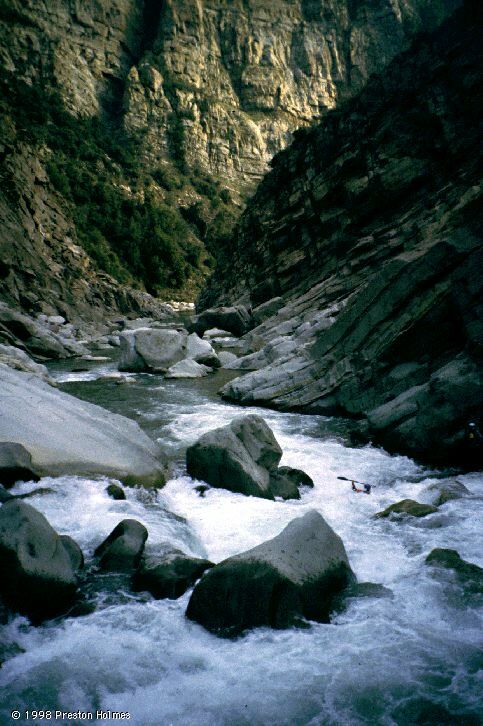 The Los Padres National Forest and associated wilderness areas is an expansive region between the coastal cities of Santa Barbara and Ventura, and the I-5 Freeway - all just north of L.A. On memorial day weekend 1998 myself, Tom Diegel, and Rocky Contos spent 3 days kayaking down Sespe Creek which runs through this incredible zone of Southern California. I was absolutely stunned by the beauty and majesty of this place, rivaling what I had seen in the canyons and rivers of California's more famous Sierras. I'm going to try and write this account for both kayakers and non-kayakers. Kayakers always want all the details, but others would find them boring and irrelevant, so I'll try and find a balance.